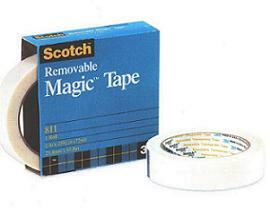 This transparent tape can be removed as easily as it goes on and includes many of the convenient features of #810 Magic Tape. It is ideal for taping before photocopying, leaving notes and memos, taping visual transparancies onto frames and more. Removable long after it's been applied. In 36 yd. rolls with 1" cores and 72 yd. rolls with 3" cores.